 Because Vetrazzo’s atelier is on the same site as the marble production facility in Tate, Georgia, he was exposed to a variety of finishes available in natural stone and was interested about how these processes might be utilized for Vetrazzo slabs. 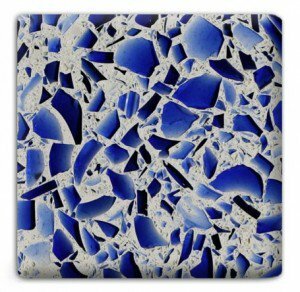 The production team used a combination of know-how and knowledge of their equipment to apply to the crushed glass slabs a technique similar to what is used for brushed granite and the end result was amazing. The pieces of glass seemed to rise up gently out of the concrete surface with the texture of a worn piece of sea glass but with an opalescent quality of a pearl, like bubbles rising to the surface of sand under the surf. See here how the appearance of the surface changes with light. How could we call it anything other than Sea Pearl? 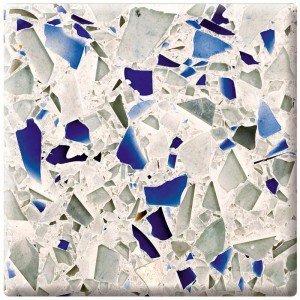 We’re finding more and more that designers and homeowners want texture and intricacy in their surfaces. 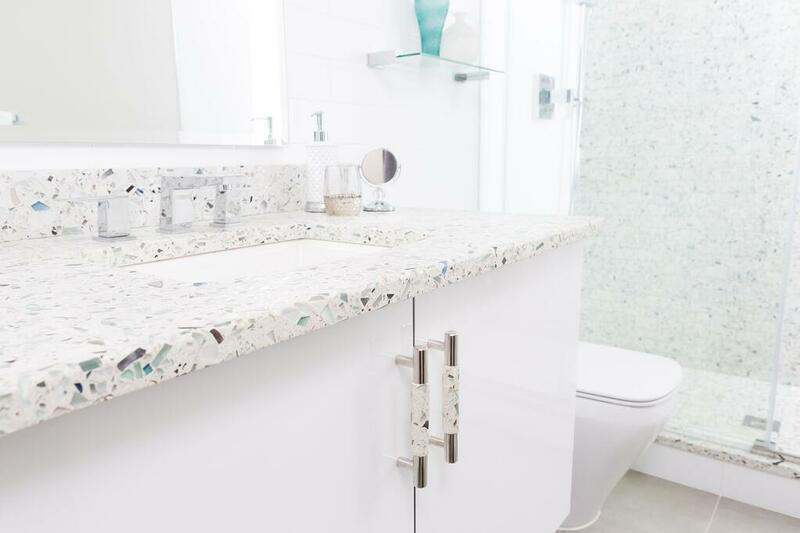 Maybe it’s an answer to the prevalence of monotonous engineered materials like quartz countertops, but what we’re hearing is customers want something with more interest, a story in every surface, as we like to say. Don't you just want to drag your fingers across the surface? We've rolled out a limited release of Sea Pearl, but the response from customers has been huge. When they see a sample they have to keep rubbing their hand back and forth over it because they can’t believe the texture. 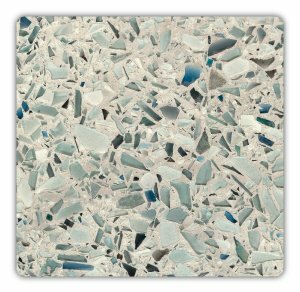 The jewel-like quality of the Sea Pearl finish on the crushed glass can turn small, everyday kitchen and bath features into focal points. Take the photos in this blog for instance. Those above and below are from a small bathroom vanity in a child's en suite in a New York home. 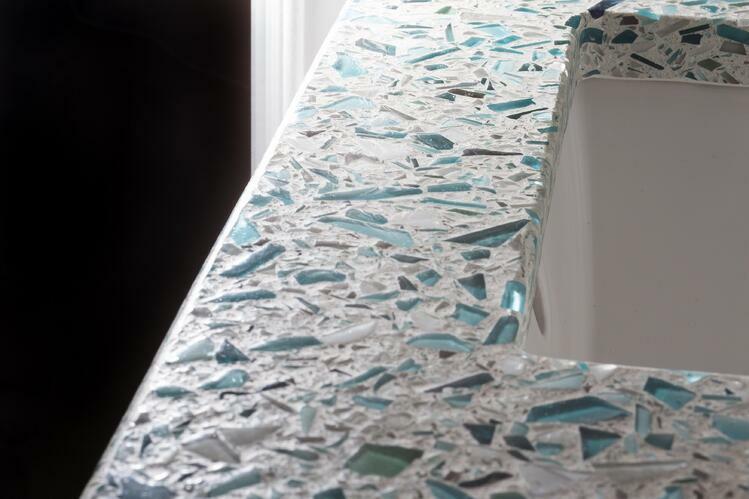 Designer Toni Sabatino used Sea Pearl finished slabs in Floating Blue for the glass countertops, shower curbs, jambs and niche. 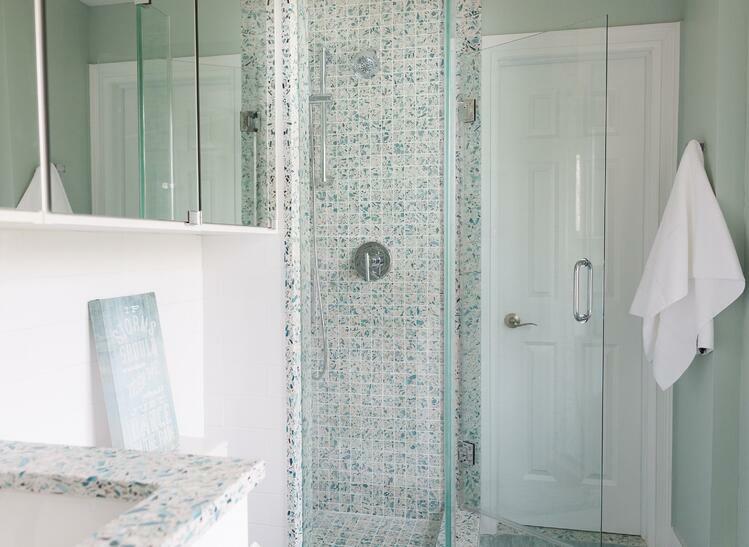 She also paired it with our original polished finish 2" x 2" mosaic tiles in the shower wall and pan. The texture and color of the surfaces, and their ability to catch and reflect light transformed the small space into a precious jewelry box. 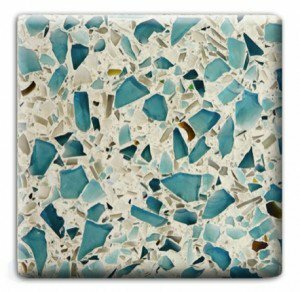 Here the Floating Blue Sea Pearl finish slab blends seamlessly with 2" x 2" mesh backed recycled glass tiles in a polished finish. 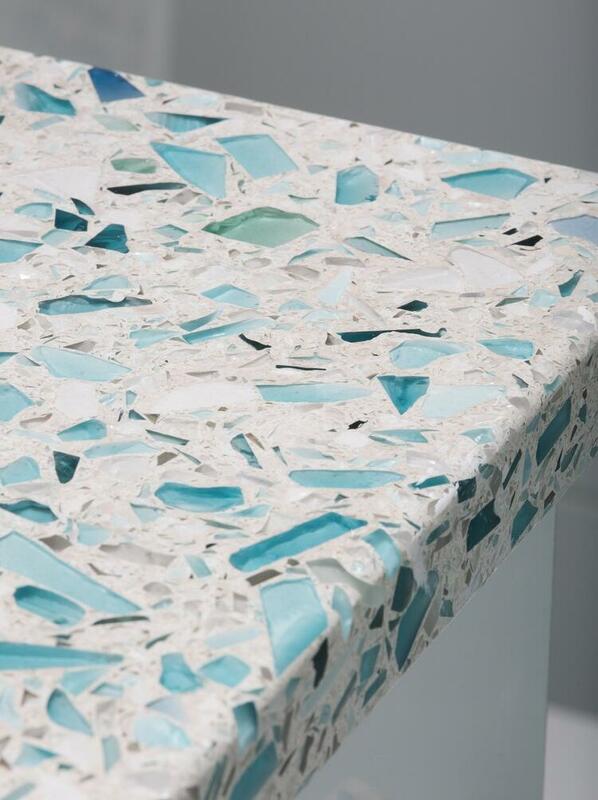 The Sea Pearl finish can be applied to our color selections that feature large pieces of glass. 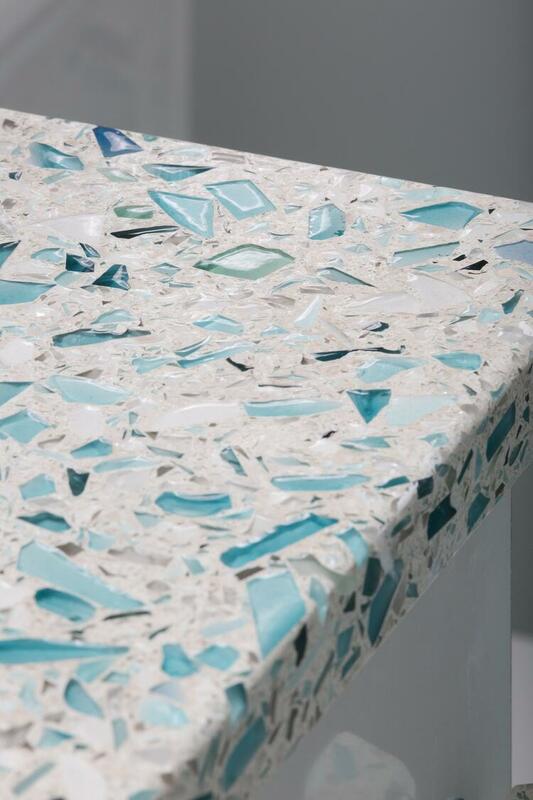 The large aggregate pieces offer more perspective in the soft undulations between the resin and the glass itself. Here's a look at a Palladian Gray vanity counter with matching hardware, backsplash and coordinating tiled shower. Click for tile details and price. 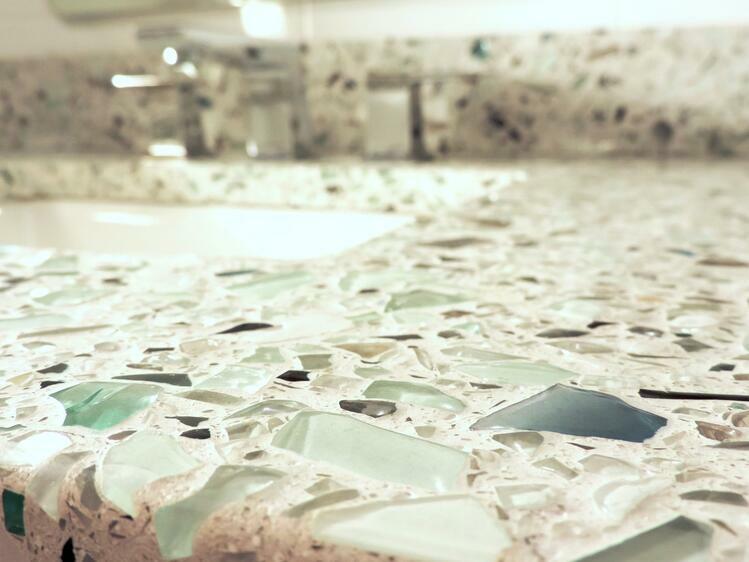 Looking to add more texture and dimension to your next design? 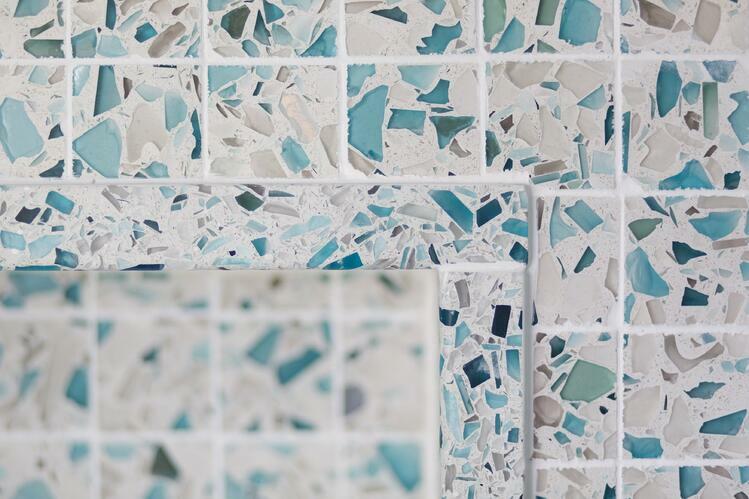 We're offering samples of Sea Pearl exclusively to members of the trade, in one of four colors. Click through the button below to learn more.